Rob Neil reports on the 2011 Australian International Airshow at Avalon, which, this year, celebrated the 90th anniversary of the RAAF. With less than 30 gyrocopters on the New Zealand register, these fascinating aircraft have not often featured in Pacific Wings. However, Leigh Mathieson believes the arrival of the first Brako gyrocopter into the country might result an increase in gyrocopter numbers. 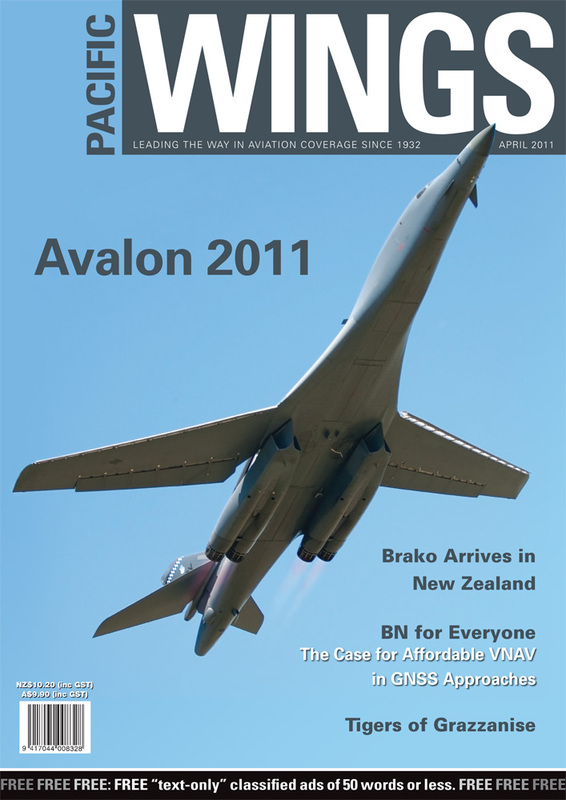 Leigh tells the story of the first Brako’s first flight in New Zealand. In one of his frequent trips away from Wellington, Erik Roelofs spent time with 21 Gruppo—the Tigers of Grazzanise—in Italy. Richard Greaney discusses options for achieving ICAO’s goal of implementing approach procedures with vertical guidance for all instrument runway ends by 2016. With so many different reports in the media about the state of the greater aviation industry and the future of pilot training, Pacific Wings asked CTC’s Ian Calvert for CTC’s perspective of the pilot training industry in the region. From the sterile cockpit of a regional jet, Don Harward thinks back upon some of the less “ordered” events and more interesting personalities in his life before he became an aviator.